Even though Star Wars: Episode VII - The Force Awakens has garnered almost universal praise among critics, one big complaint from some fans has been haunting this movie ever since it's release. Many have pointed out several glaring similarities The Force Awakens has with previous Star Wars films, such as the introduction of a new hero living on a desert world and a superweapon capable of destroying planets, both of which can be compared to elements seen in A New Hope. (We discussed this extensively in the latest SWU Podcast.) 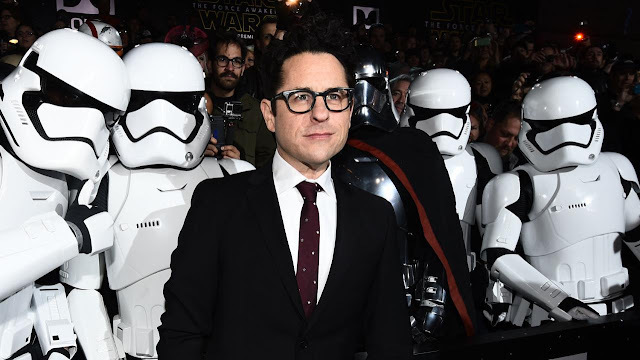 The online chatter has been so strong lately that director J.J. Abrams himself has responded to the critics. "I knew that, whatever we did, there would be a group of people — and I was just hoping and praying that it would be smaller than not — that would take issue with any number of things, But I knew we weren't making the movie for any other reason than we believed that it could be something meaningful and special and entertaining and worthy of people's time." "I can understand that someone might say, 'Oh, it's a complete rip-off!' What was important for me was introducing brand new characters using relationships that were embracing the history that we know to tell a story that is new — to go backwards to go forwards." "I realized when I was working on [The Force Awakens], the amount of energy that was required to tell the story, and do it justice, knowing when Episode VIII would start shooting, there was no way — if I wanted to still have my children talk to me in my old age — that doing that would make any sense,"
"Larry [Kasdan] and I had a bunch of thoughts of where certain things could go and we shared those things with Rian Johnson, who's directing VIII. He had things that he came up with where he asked if it was possible if we could make some adjustments with what we were doing at the end, most of which we did — there were just a couple that didn't feel right, so he made adjustments — but it was just collaboration." Of course, you can listen to the full interview by clicking here! I didnt really mind that they revisited the story format of ANH. But I wish there was a bit more "embracing the history" in regards to the lore of the SW universe. Aside from bring back some OT cast members and a few iconic designs the rest of elements of the movie felt like a reboot, rather than sequel. A droid has info within it. Droid bumps in to a youth on a desert planet ... the youth has no immediate family. The Millenium Falcon whisks them away from the desert planet. The bad guys destroy a different planet with their planet sized super weapon. Our heroes visit a bar full of many types of alien. The youth receives direction from an older and wiser soul. The rebels meet and using the info from the droid form a plan that a few fighters can blow it up. Episode IV or VII ? To quote a line from another great, decades-old film, Stripes: "Lighten up, Francis." It's Star Wars! Did you have fun? Did you cheer? Did you get sad, or cry? Mainly, did you leave entertained? I know we did! Yup, pretty much. You nailed ithe Simon. There is a historical precedent. Wasn't World War II a reboot (more intensified, sure, and far more heinous) than World War I? It is the nature of a ring story (which Star Wars is, look it up) to repeat itself. It helps tie parts together, but some things change. I wont list the changes, you know them. Just sit back and enjoy because so far, this beats the prequils in my mind. This ensure that Star Wars will not be rebooted for an even longer time. It also brings new fans into what I believe will be two more trilogies. I have family that had no interest in star wars before the force awakens. Now they have a sense and an appreciation for star wars without having to watch 14 hours of previous content. It's not a problem for me to be surrounded by new star wars fans. Is it a problem for you? JJ Abrams, a great director who loves Star Wars actually made a Star Wars movie for everyone and there are people who actually hate it that much? Sure there may be a couple of things I would have done differently but please, it was a great movie. I challenge anyone to do better. AND THEN BOTH BODIES WERE UNCLAIMABLE FOR PROPER BURIAL!!!!! BOOM! That's why I for one enjoyed the prequels, don't get me wrong they had some flaws but the whole prequel trilogy took on more of a mature setting with factions in different shades of grey rather than standard bad guys versus good guys. It helped show starwars was more than 3 films but it was in fact a whole universe pact full of lore. The force is strong in rey. Is she the chosen one how will bring balance to the force. No matter how much you book fanboys clamor to the EU it's never going to become canon, so deal with it or simply don't watch the new films. Many of those books were garbage. Ooh Ooh! VII! Because in IV they visit the alien bar Before the Falcon whisks them away from the dustbowl planet! Seems like a whole new movie when switch those scenes, doesnt it? The droid didn't have anything about Starkiller Base. To SIMON LEE: Clearly, that is Episode IV as BB-8 didn't have anything on Starkiller Base within him. Again, I don't find the similarities to A New Hope that annoying. Especially as it can be superficial at times. For example: Jakku being a desert planet. While it might have been a good idea to do a different biome, Jakku and Rey's life there felt very different than Luke's or Anakin's life on Tatooine. With Luke, he was a farm boy. His life wasn't all rainbows and puppies, but it was decent. With Anakin, yeah, he was a slave, but he seemed relatively well treated*. Also, in both Anakin's and Luke's case, they had family. Now, look at Rey. She's clearly living a day-to-day existence, surviving. And she's alone. *Will like to add that I am not endorsing slavery. Just saying that as far as slave lives go, Anakin was living one of the less sucky ones. Personally I dont mind of it having a few plot similarities to a new hope what matters is that were given a new stars wars movie in a brand new trilogy so that new fans can go to learn more about the whole starwars is and was in the two previous trilogy it was fun I do admit though that hans death was sudden and didnt feel more impact. But if people are going to tear the movie apart dont because were just fans i doubt anyone fans can actually go out find a cast and have money to make a fantastic movie. The cast and writers did all they could so yes. World war 2 a reboot!!!? Seriously!!! You are a prat. It is a reboot/remake. Played it safe, went the unoriginal route, made a hollow fan boy film,(like star trek) and cashed in. For the record. The droid had nothing to do with the plans to destroy starkiller base.... He didn't have the base plans hidden in him, just the last remaining map piece from the map to Luke. What about when the iconic experienced techer/mentor figure that dies?